A few years ago I made the announcement that filming had commenced on the follow-up movie to What the BLEEP Do We Know!?. 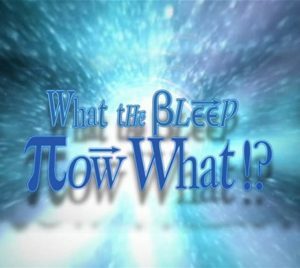 At that point the film was being called What the BLEEP: Now What!?. Working once more with Betsy Chasse, we wrangled many of the “stars” from BLEEP, added a few new ones, rolled the cameras and even did some posting on Facebook about the progress. What happened? Did the prodigal movie get lost out there in the land of creative machinations? Did the movie wave function decide to NOT collapse and the potentials are still awaiting the Observer? Well, yes and no. I started out thinking that BLEEP 2 would be a ground-breaking update covering ideas and discoveries in quantum physics, brain neurology and consciousness studies introduced over a decade ago. What was new? How had the discussion from WTB (What the BLEEP) moved and evolved? Where were we now? Unfortunately, after six months of editing interviews, I realized we were just hitting the REPLAY button, doing a new film like the old film with a few updates and not much of anything new. Nothing exciting about that. And since experience has taught me that making a film is so much hard, hard work you’d better be very inspired with it (more like obsessed) to stay the course, I put the interviews on the back burner to marinate. Where they still sit until something exciting shows up. That said, those interviews were/are extremely valuable to me. What emerged from them was not a Grand Theory of How It All Fits Together, but rather how the Mystical Experience (something talked about through the ages) interacts with and affects our modern world—or not. While interviewing American psychologist and parapsychologist Charlie Tart, he talked about “the bright shadow”—how the taboo of mystical perception is upheld throughout different areas of society and the ramifications of that. Many scientists told me about “behind the napkin” discussions they’d had with colleagues about “weird” and “spooky” events they’d witnessed, but couldn’t talk openly about. In reflection I came to see that the bright shadow was not just individual, but also societal. If the direct Mystical Experience is a valid way to receive information (which philosophers of science like Erwin Laszlo and mathematical physicists like Sir Roger Penrose believe is the foundation of existence) and that mystical pathway to information is cut out of our world, then the result is — well look around. Life out of balance. And that’s where BLEEP 2 sits: On hold with some 60 hours of interviews in the can. It does keep rattling around in my head and who knows … I never thought I’d make the first BLEEP. So we’ll see. You may want to take a look at this interview site. After the Bleep conference at SFU in BC, this is the direction the exploration went – not just mystical ideas but direct experience. If you contact Rick with what you’re looking for, he can recommend the better ones. Under Past Interviews, there is also a category listing, including scientists, etc. Personally, I am just wondering where the Bleeping Herald edition is for August 14th, 2018? Its a blank page – just a title. I tried posting in the comments section but wasn’t allowed. Setting aside making a second video, why is this blog not being posted to? First, Thank you very much for creating ‘What is the bleep do we know?’ it was a great confirmation for a lot of collective ideas and thought precess lead me to have the same information in me and you added more to it, from that time until today, i always recommend any one whom he interested in this vast connected universe to watch it.